As a child in the early 1960s, Henry Breed often visited his grandmother at her home on Maple Road in Cornwall-on-Hudson. Although his grandmother, Ethel Burns Breed, died more than four decades ago, he still cherishes those early memories. And in tribute to those memories, Breed is now trying to find some pieces of furniture that were sold at auction and possibly re-purchase them. Henry Breed, who works today for the United Nations General Assembly, has photos of several of the items that he would like to track down. He is hopeful that the pieces were purchased locally at the estate auction that was held in the summer of 1966 on the lawn of his grandmother’s home. The auctioneer was George Freer of Glenwood Auctions in Newburgh, which is no longer in business. Ethel Breed was well-known in the community, active in education, and served as president of the Cornwall School Board. Henry Breed says that his grandmother was a close friend of Connie Hahn, who lived on Duncan Avenue, and he remembers visiting her home as a child. Henry would be delighted to recover two family bibles that had important genealogical records in them, including details that could have linked Mrs. Breed back to the Scottish poet Robert Burns. Breed says his grandmother sold this painting to either a friend or a friend of a friend a few years before her death in 1966. He describes the painting as a beach scene with two grown women and two small children who might have been building sand castles. 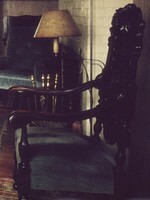 Henry Breed does have photographs of several pieces of furniture that he believes were sold at the auction in 1966. One is an ornately carved high-back Jacobean revival, dark walnut chair, with turned arms and, originally, a seat upholstered in medium blue wool. 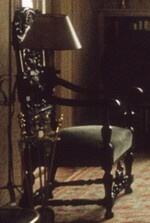 He’s got the matching chair in his apartment in the City, along with the upholstered seat that he would love to return to the original chair. He also is looking for a large, black walnut drum table, with scalloped edging, and legs that end in hoofed feet that emerge from carved rams' heads and sit on casters. A caned mahogany or black walnut daybed, circa 1920, originally with dark blue cushions, pillows, and bolsters, are also on his list, along with a seven-drawer mahogany kneehole desk from the late-19th or early-20th century". Lastly, parts of china set with the “Orleans” pattern by Charles Ahrenfeldt of Limoges, circa 1913, were among the items sold at auction that Breed would like to recover. If you have any information about these items, please contact Henry Breed by email at breed@un.org, or by phone at 917-239-7374. If you have any leads or recollections of Mrs. Breed, feel free to leave them below here by clicking on the COMMENT button. Trying contacting the former local autioneer, Joann Grant, who conducted business at the Storm King Cinema Bldg (now "Nicky's Restuarant"). Good Luck! many thanks for this lead! but i have not been able to find a listing for her. is she still in cornwall? and, if so, would you have a number? grateful for whatever further assistance you could provide.